a fresh new start — woohoo!! This coming April, we’ll have been in our house 2 years and since we moved in, I have been searching for the most economical way to work with the space in my office to be as efficient as possible and to not be overwhelmed by clutter all of the time. While I would love to Elfa out the the whole place, that’s just not affordable. Even the kitchen cabinets and stuff I checked out at home improvement stores just wasn’t in our budget. The most affordable thing I found to use in the studio, which is also really heavy duty and durable, as well as pretty flexible, are the cool chrome shelving units we found at Sam’s. We had used them in the kitchen when we had no pantry and then they were moved down to the studio when we updated the kitchen. In the past month or so, I came up with a new layout. I felt kind of bad because Tim and I spent Independence Day weekend moving stuff around and I was going to make him work again, but of course, he just wants to make me happy. How awesome is he? Anyway, the difference between this office move and the last is that I am really organizing all of my stuff. 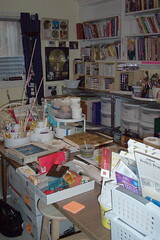 Not just shoving stuff around, but going through every drawer, box and bin to see what I really have. I have found all kinds of amazing things I’ve forgotten about. And oh man, you would not believe the paper stash!! Day 1: Tim and I assessed the plan and decided in what order everything was going to move and what we had to do to make that happen. 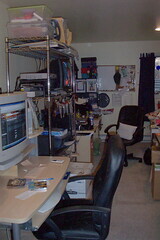 You see, the idea of moving everything out and starting from scratch is way too much for me, so we decided to move things a bit at a time…a desk here, a file cabinet there, stacking things and shoving things out of the way for each phase of the move. 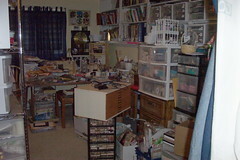 I put away as much loose stuff as I could and began shoving everything out of the way. We moved the desks and set up one of the shelving units to hold all of the electronic equipment. We also moved Tim’s computer downstairs so we could free up space in the family room. Day 2: Tim and I kept moving things and we built the new shelving unit so it would be two 3-shelf units. We also broke apart one of the units that was already in the room and lined them all up along the wall underneath the built-in bookshelves. 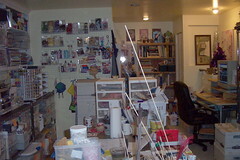 We also moved my craft table and the big table into the center of the room. I thought it would be cool to set up the little craft table over by the window so I can use that for sewing. 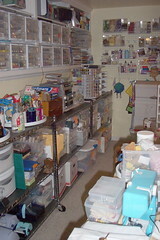 My original plan is to make the worktable free of anything other than what I’m actually working on. I also emptied all of the iris carts (except for 2) and now I am the proud owner of many bankers boxes with orange sticky notes on them that say “sort”. Day 3: I was really tired and only spent an hour or two arranging things and doing light sorting. Day 4: Today, I spent all day again and got everything off the floor, into boxes for later sorting or placed in their final (or semi-final) homes. 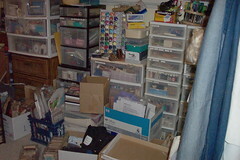 I can see where a few things are going to get moved, but not until I’m completely done sorting and know what I have. So now I’m making lists of the stuff I need to sort (rubber stamps, magazines, the closet, the boxes that say “sort”…) and I’m planning on tackling one item a week until it’s all done. I’m really excited! So that’s what I did on my “break”. I’m really pooped, but very satisfied with my progress. Finishing UFOs — I found two shelves’ worth during the reorg! Figuring out who I am as an artist and where I want to go with it. I’m not going to join swaps willy nilly and I’m not committing to anything that doesn’t help me in some way toward my goals. Posted on January 4, 2009 December 19, 2014 Categories art and life, organizing4 Comments on a fresh new start — woohoo! !